Chennai, the capital city, popularly regarded as the 'Gateway to the South represents a culture that is distinctly different from that of northern India. The places of interest are Kalakshetra, a school of art and music that encourages exponents of Bharatnatyam, Carnatic music, traditional weaving and designing; Fort St. George built in 1653 during British reign in India, - now houses the Secretariat and Legislative Assembly of Tamil Nadu; St. Mary's Church, the oldest Anglican Church in India with its premises; Sri Parthasarathy Temple built by Pallavas in the 8th century AD; Kapaliswara Temple, Mylapore also an eighth century Pallava Temple dedicated to Lord Shiva; San Thomas Cathedral Basilica rebuilt in 1606 as a cathedral and in 1896 it was made a basilica; and Theosophical Society - the world headquarters of the Theosophical Society formed to encourage the study of comparative religion philosophy and science. Mahabalipuram Temple Complex - A small seaside village; it was once the main port of the Pallava Dynasty from 05th to 9th centuries. Today it is the site of several antique sculptural marvels. Declared as the world heritage site by UNESCO, Mahabalipuram boasts of some of India’s most sublime rock-cut art. The town was earlier called Mahabalipuram, but was later renamed as Mamallapuram or the place of the great wrestler - Narasimhavarmam I. Rest of the day at leisure. After breakfast proceed for the sightseeing tour of Mahabalipuram. The only shore temple, which remains here, is the spectacular two-spired shrine, which is unique in that it houses both Vishnu and Shiva in its sanctum. The open-air bas-reliefs, structured temples, man-made caves and the five monolithic “Rathas” (chariots carved from single processions) reflect this art at its best. "Arjuna's penance" here is the world's largest bas relief measuring 27 meters by 9 meters. The tour of the temples ends with a visit to the ‘Shore temple’ designed according to the description of the original plan from ancient Hindu texts, consisting of a compact temple with two spires with the main alter facing east. Rest of the day at leisure. Pondicherry. The French ruled this territory for 300 years, and today, it stands as a living monument of the French culture in India. Pondicherry traces its origin to Saint Agasthya, the revered sage of the south. The excavations near Pondicherry reveal that a Roman settlement existed here, 2000 years ago. It was also the site of many a battle between the British and the French, and was the capital of French India, before it attained its independence. This restored, attractive, former French colony exudes a Mediterranean aura with its chic streets, elegant houses and ornamental gardens. Being a small and quiet enclave of Tamil Nadu, it has imbibed the Tamilian culture. Although the French influence is gradually fading, Pondicherry retains a few Gallic accents. Pondicherry's main sights are the Rai Nivas, the Sacred Heart Church and the Sri Aurobindo Ashram. The ashram retreat was founded in 1926 by Sri Aurobindo after whose death the spiritual authority passed to one of his disciples, a French woman known as the Mother. The Mother was also instrumental in	founding the city of Dawn Auroville, 10 km from Pondicherry. Its original charter aimed at creating a city of the future where people from India and abroad could live and work together in a spiritual environment. Afternoon, arrive in Pondicherry and check-in at your hotel. Later visit Colonial Buildings of Pondicherry with Aurbindo Ashram & Manakula Vinayagar Temple. After breakfast you will be driven to Tanjore (185 kms/ 4 hrs 30 min approximately). 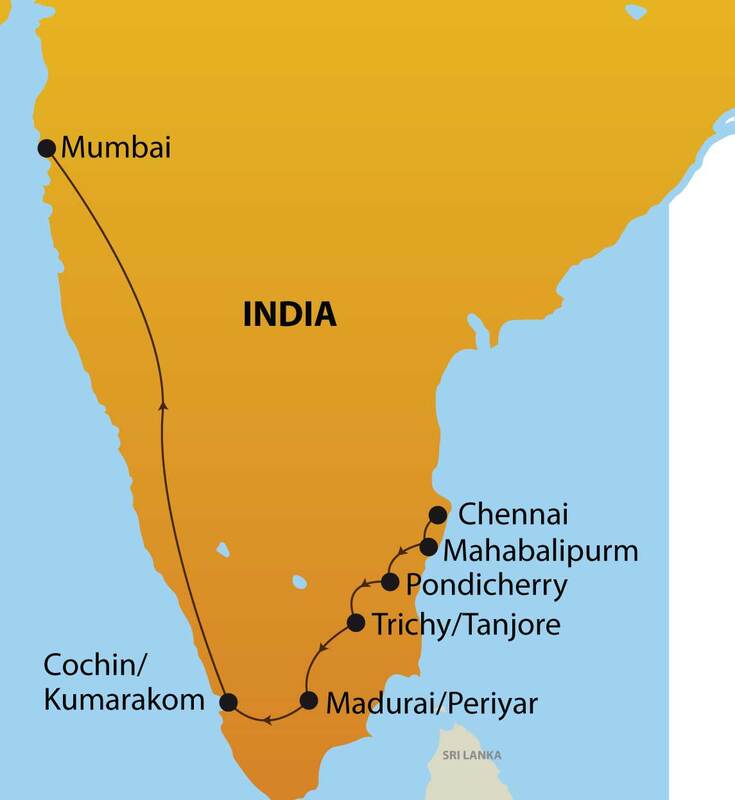 En route visit Trichy Trichy or Tiruchirapalli is, situated on the banks of river cauvery had been a chola citadel since the sangam age. Though the pandyas and the pallavas held sway in this region for short periods; the greater part of the town & the historical Rock Fort, were built by the nayaks of Madurai. Tiruchirapalli is also famous for the Ranganatha Temple at Srirangam, a picturesque island on the river Cauvery. Today Tiruchirapalli is a blend of history & tradition, a pilgrim centre as well as a thriving commercial city. Visit The Rock Fort Temple, a spectacular monument perched on a rocky outcrop overlooking the old city. Finally at the top of the hill, is the Ucchi Pillayar Koil - a Ganesh Temple, offering a commanding view of the city. Late afternoon drive back to Tanjore. Tanjore or Tanjavur as it was earlier called “rose” to glory during the later Chola period between the 10th and 14th centuries ad and became the centre of learning and culture. Overrun by green fertile plains, Tanjore is known as the rice bowl of Tamilnadu. The destination has a large share of the ancient temple wonders of South India. The district is also known for its exquisite handicrafts, bronze statue castings, pith temple and south Indian musical instruments like the Venda and mridangam. Visit the Sri Brihadeshwara Temple built by the great Chola king, Raja Raja I in the 10th century AD; this temple is an outstanding example of the Chola architecture. Guarding the inner shrine of the temple is the gigantic statue of Nandi, the Bull, while the walls of the sanctum are covered, with the wall paintings of Chola and Nayak periods. This superb monument has been listed as a World Heritage site by UNESCO. Afterward Drive to Madurai. Known as the Athens of the East, Madurai is tucked snugly in the recesses of Tamilnadu, on the sacred vaigai river, Madurai - a city shaped like a lotus - is the destination of thousands of pilgrims. Madurai is the oldest and the second largest city in Tamilnadu. The legend has that the pandyan king kulasekhara, built a great temple and a lotus shaped city around it. On the day the city was to be named, lord Shiva appeared to bless the people nectar flowed from his matted locks. So it was called ‘madhurapuri’ and later it became ‘Madurai’. Enjoy a visit to Meenakshi Temple. One of the most important places of Hindu pilgrimage, the temple is the very centre of cultural and religious life for the residents of the city. It is a riotously baroque example of Dravidian architecture with gopuram (spires) covered from top to bottom in a breathtaking profusion of multi coloured images of gods, goddesses, animals and mythical figures. The temple complex has two main shrines one dedicated to Sundareswarar (Shiva) and the other to His consort Meenakshi (Parvati). The 1000-pillared hall in the complex houses the Temple Art Museum, which contains friezes, stone and brass images and the best exhibits on Hindu deities. Evening, witness Prayer Ceremony at the Meenakshi Temple. Lake Periyar is where animals come to drink. Sail within close range of elephant groups, feeding and bathing. Scout for statuesque sambar deer and giant wild oxen, or guar, browsing in the marshes. Search the green wooded shores for wild boars, monkeys, and an array of birdlife. If you are lucky, you will get a rare sighting of tiger. Spend the night in splendid isolation at your comfortable jungle cottage. This Morning visit The National Park at Periyar boast of a rich and diverse Flora. The woody grass land to the center of the sanctuary as well as the tropical forests. The Savannah grassland and the thick vegetation bores different types of shoots and grasses. About 2000 species of flowering plants belonging to about 160 families and 823 genera were identified in the park premises. The major trees identified are Teak, Rosewood, Terminalia, Eucalyptus, Sandalwood and Jacaranda. Other common trees are Mango, Jamun,Tamarind and the Banyan trees. The open grass land is filled with tall and nutritious grasses. This morning begin your overland journey to the Kumarakom. The drive takes approximately 3 hours. The landscape is dominated by never ending paddy fields, mango and cashew groves, swaying coconut palms, meandering lagoons and backwaters, and mangroves nesting birds of a hundred varieties. During your stay you can arrange for an Ayurveda massage, an intricate system of healing that originated in India thousands of years ago. Genuine age-old traditions and treatments are practiced by highly qualified and reputed physicians. The Ayurmana spa caters to your total rejuvenation and therapy needs, in the ambience of an authentic, age-old Tharavad. After breakfast drive to Cochin (63 Km – 01 Hours Drive). Arrive Cochin and check in at the hotel. Evening witness Kathakali Dance Show. Kathakali Dance Show- 'Katha' means story and 'Kali' means dance. 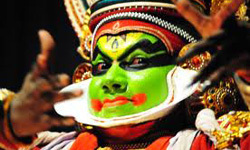 As the name suggests Kathakali is a beautiful amalgamation of dance and drama. More precisely, Kathakali is a harmonious blend of five forms of art namely, Sahithyam (literature), Sangeetham (music), Chithram (painting), Natyam (acting) and Nritham (dance). 'Total Theatre' is the word often used to describe this highly evolved art. Kathakali dance-drama can also be described as a visual art because performers do not say any dialogues in this. Rather they are mime. Communication is made effective through the remarkable use of gestures and mudras. This also lends Kathakali its universal appeal. People of varied tastes all over the world appreciate and admire the beauty of this distinguished art. Another distinct feature of Kathakali is its elaborate costume and make-up. It is a magical sight to watch Kathakali artistes performing in their traditional attire. Their larger than life form transport the audience to a make believe wonderland. Morning transfer to the airport for the flight to Mumbai. Arrive Mumbai. After collecting luggage you will be met by outside the baggage claim area and escorted to a waiting vehicle for your transfer to the Hotel. Mumbai’s (formerly Bombay) original inhabitants, the Kolis gave the city its Indian name, Mumbai, after their goddess, Mother Mumba. The early Hindu rulers were conquered by the Sultans of Gujarat who were later superseded by the Portuguese. The British, who followed, received these seven islands as a dowry when Charles II married Catherine of Braganze. The British Crown in turn leased them to the English East India Company for 10 pounds in gold. A far-sighted President of the Company, the real founder of modern Bombay, was Gerald Aungier. He invited Hindu and Parsi merchants from Gujarat to come to Bombay and develop it. From then on Bombay never looked back! Today the cosmopolitan population of the city consists of people from all over the country. It is the center of industry, commerce and foreign trade, a city of skyscrapers and huts, a city of milling crowds and vitality. Enjoy a full day of exploring Mumbai. Begin with a visit to ‘The Gateway to India’, Mumbai's most recognized monument. It was constructed to commemorate the visit of King George V and Queen Mary to the city. It was completed in 1920 and remains as a striking symbol of the British Raj era. After this era ended in 1947, the last of the British troops departed through the Gateway of India. The looming Gateway is designed to be the first thing that visitors see when approaching Mumbai by boat. Mumbai has some captivating heritage buildings where you can marvel over staggering examples of intricate colonial architecture. Some of the best are the Gothic looking Prince of Wales Museum in the Kala Ghoda art precinct, Victoria Terminus railway station, the Bombay High Court and the buildings of Horniman Circle in the Fort area. The feature of Horniman Circle is its huge gardens, which provide a welcome respite from the hustle and bustle of the city. Drive up Malabar hill to see the ‘hanging’ gardens and enjoy a panoramic view of the city and Queen’s Necklace (the Marine Drive). Drive through the Flora Fountain and Fort area and view the Gothic style buildings. Continue to Mani Bhavan, Mahatma Gandhi’s home and Museum. This charming, 3 storied Gujarati house, painted brown and yellow, in a lovely Parsi neighborhood on Malabar Hill, was the home of Mahatma Gandhi from 1917-1934. Now overseen and maintained by the Gandhi Institute, it houses a library and a small museum about Gandhi’s life and birth. You can visit Gandhi’s room, where his simple belongings are displayed including his personal Bible, Quoran and Gita. (Washerman’s hub). This massive open air laundry provides an unforgettable glimpse into the inside of the city. Dirty laundry from all over Mumbai is brought here and painstakingly hand washed by the dhobis (washermen) in the seemingly endless rows of concrete troughs. The profession, handed down from generation to generation, requires incredible strength and determination. The thousands of dhobis spend hours every day standing up to their knees in water filled with chemicals, manually scrubbing and beating the dirt out of each item of laundry. This earns them approximately $ 2.50 US per day. Stop at Crawford Market, one of Mumbai's most famous markets. It is named after Arthur Crawford, the first Municipal Commissioner. It houses wholesale market for fruits, vegetables and poultry. Completed in 1869, this Norman and Gothic architectural marvel was the first building in the city to be lit with electricity. Transfer to the Mumbai International airport for your flight to onward destination.